Workshops are offered across the United States on an on-going basis, and online registration is available below. Upcoming workshops will be announced here as soon as their details are confirmed. Workshops offered regularly by institutions or other instructors are also listed below. The 4-day Care and ID workshops often fill to capacity in a short time, so register early to ensure a place. "I loved your workshop! It was incredibly informative and so much fun. The course format kept things interesting and provided untedious reinforcement of unfamiliar subject areas, and your command of the subject, ability to convey complex concepts simply and clearly, patience, and sense of humor really made it all worthwhile. Yours is probably the best workshop I've ever attended. Thanks!" "Can't thank you enough, Gawain! Your knowledge, and the presentation of it, far exceeded expectations." Designed for book and paper conservators, this 4-day workshop is designed to teach mid-career non-photograph conservators basic cleaning, stabilization, and repair techniques particularly for library and archive collections. 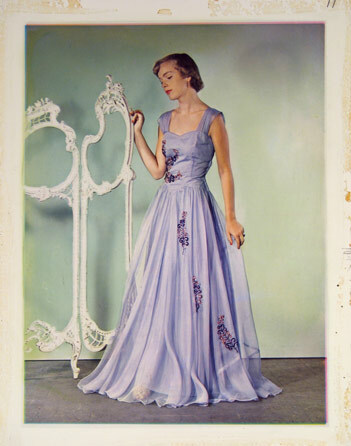 Class Description: Photographic materials cover a diverse range, everything from the daguerreotypes and wet plate negatives of the 19th century to the gelatin silver, chromogenic and inkjet prints of the 20th and now 21st century. Care of Photographs offers a broad introduction to the history, technology, identification, and care of these and other photographic materials. Topics include environmental monitoring, the effects of temperature and relative humidity, and the importance of cold storage for certain photographic materials. It is intended to help those caring for photographic materials to gain a better understanding of their collections and how to care for them. The Basic Photographic Sample Set is an integral part of this course and provides an important hands-on component for photo process identification. Customized workshops for your institution can be arranged for any length of time and on a wide variety of topics relating to the care, conservation, and technical history of photographic materials. 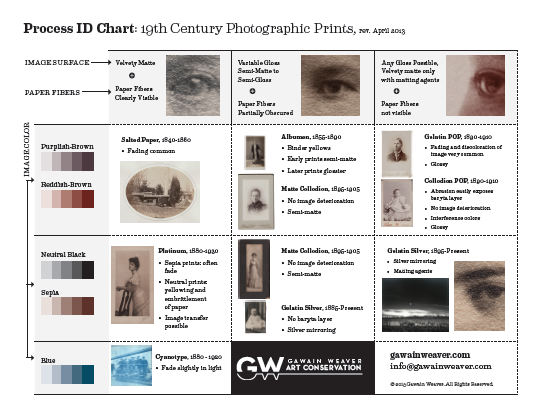 Past workshops have focused on an in-depth understanding of the history, nature, and deterioration of the gelatin silver print, and the care and identification of color photography from the 19th century to today's inkjet prints. An extensive collection of sample prints from the entire history of photography is used to illustrate and provide hands-on experience for students in the identification and understanding of photographic and photomechanical processes. Please contact Gawain Weaver directly to discuss how a customized workshop can be planned to meet your needs. The George Eastman Museum offers a series of workshops taught by process historian Mark Osterman and others. Some of these workshops offer hands-on instruction in the creation of historic photographic processes combined with the viewing of historic prints from the George Eastman Museum collection. Mark has a remarkably deep hands-on knowledge of these processes and these workshops offer a unique opportunity to gain an in-depth understanding of specific processes. The Basic Sample Set was created as a starter set of eighteen photographic and photomechanical processes to be used in workshops on the care and identification of photographs. Visit the store.